Design Guidelines; Are They Enough? 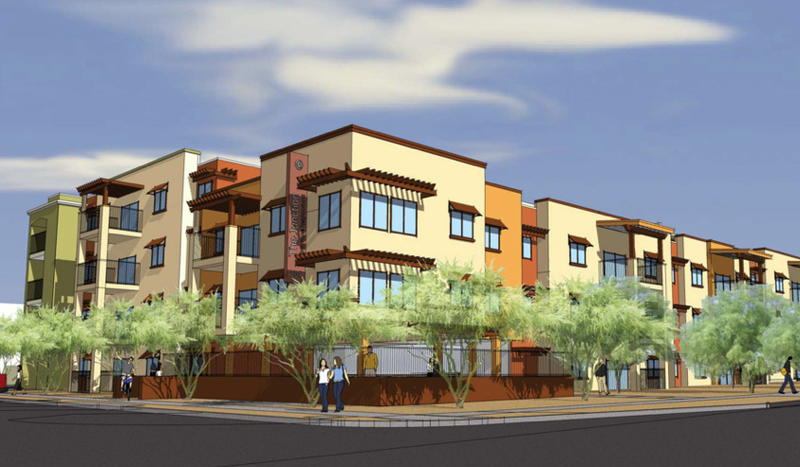 Stephen Paul and Demion Clinco, featured in Wednesday’s Star call for a design approach to the onslaught on Tucson’s historic core in the feature, Design Guidelines Needed to Protect Character of Tucson’s Historical Core. The image embed of The Junction @ Iron Horse is not what they are calling for, but like other new housing projects with modern curb appeal, it is context insensitive. These projects give us taxes, but unfortunately they promote divestment in homeowner occupancy. The post real estate crash era inspired a lot of business incentives, but nothing for neighborhoods. Guidelines are easy and necessary but can they turn things around those of us who want to live here? How about sustainable planning with incentives to help insure owner occupancy is a safe investment. How about something in return for the lucrative zoning incentives we give to commercial ventures. The Infill Incentive District alone allows as much as 25% more in zoning allowances than base zoning such as in The District at 5th. The Main Gate Urban Overlay District offers as much as a 400% increase in heights. These make money but are lost opportunities for neighborhoods. When zoning can’t be trusted, homeowners move. That’s a price that has not been a factor in planning the core. What if for every 20 million dollars in value added zoning opportunities we grant developers, a million of it has to be re-invested in neighborhoods. If value compounding zoning incentives within the core totaled 500 million dollars from 2008 to 2018 that would be 25 million dollars in neighborhood reinvestment. How much additional investment in neighborhoods would that generate? Since the crash we did incentivize roughly 20% of that but with no equation for trade off investing that directly benefit neighborhoods. We know development will come, but how should we channel it in and around sensitive old neighborhoods that are worth keeping.